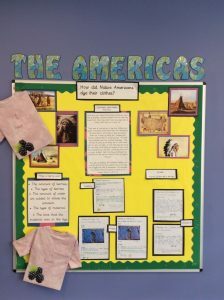 The Americas in year 5! Have you ever noticed that Native Americans wear lots of brightly coloured clothes? But how did they create them when they didn’t have any dyes like us today? Well read on to find out. 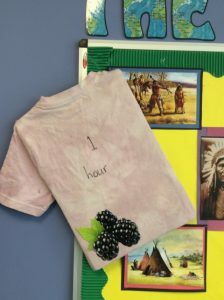 They used to use berries to dye their clothes and tepees. First, they would break down the cellulose of the fruit (this is what helps it keep its shape); there are 3 ways of doing this, freezing the berries, heating them or crushing them. We think they probably used the crushing technique. This releases the juice of the berry but it’s still mixed with the skin and pips, so how did they get rid of it? Next they would sieve the mixture to get rid of the unwanted pips and skin, would you want this on your clothes? After that they would put their material into the dye and leave it there to absorb the juice. This got us thinking. We wondered whether the amount of time that the material was in the dye would affect the rate of absorption. We recreated this Native American practice as part of our science lesson to find out. The results were really interesting and not what we expected. We predicted that the longer the material was in the dye, the more it would absorb. However, our results did not show this. 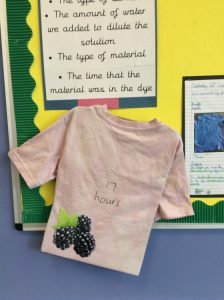 We left the material in the dye for 1 hour and 17 hours and there was very little difference (see the picture below) so we think that there must be a maximum absorption time. 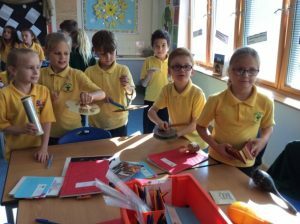 This really started our science lessons with a bang and we have all enjoyed doing more science every week! This week in Year 4! This week, we have been learning about Christopher Columbus. We researched him on laptops and made a plan of all the interesting facts. We used these notes to write a non- chronological report. I thought this was quite a hard lesson, yet exciting! It was fun to learn about a famous explorer! 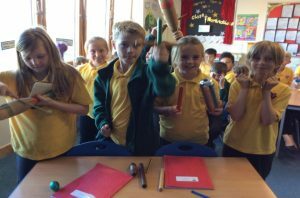 On Tuesday, we had an art lesson in which we were using instruments to make sounds of a picture. The picture was of a stormy sea! We created a sound recording to depict the landscape. We all used different instruments to make different sounds of the picture. I chose a wooden beater because it sounded like lightning. Ella chose a shaker because it sounded like waves. My table and I really enjoyed it! 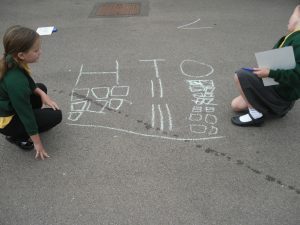 In maths this week, we began bar modelling. It gets trickier every day! We use traffic lights to show how secure we are. We usually focus on one thing for two lessons but it can be up to a week long. We also did estimating last week. This term our topic has been related to the magical, mystical World of the Circus! 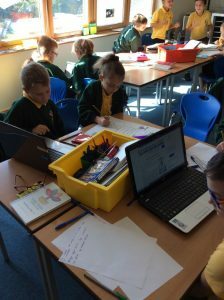 Over the past two weeks we have researched many areas of the circus world and have discovered many interesting facts. This week we have used all the information gathered to write non-chronological reports. 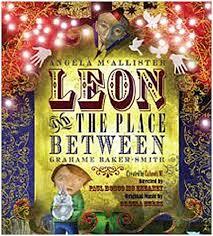 We read and discussed ‘Leon and the Place Between’, a book based on characters in a circus environment. In small groups we created our own ‘play scripts‘ linked to the class text, and based our characters on the characters who had visited the ‘place between’. When each group had completed this task we performed our scripts to the whole class. 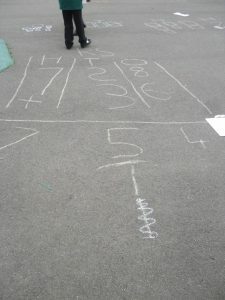 In maths, we have been learning about column addition. It was tricky but we have all kept trying! 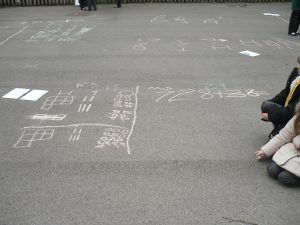 We went outside and using chalk we drew the ‘real story’ to physically make a column addition sum. Below you can see evidence of our work.